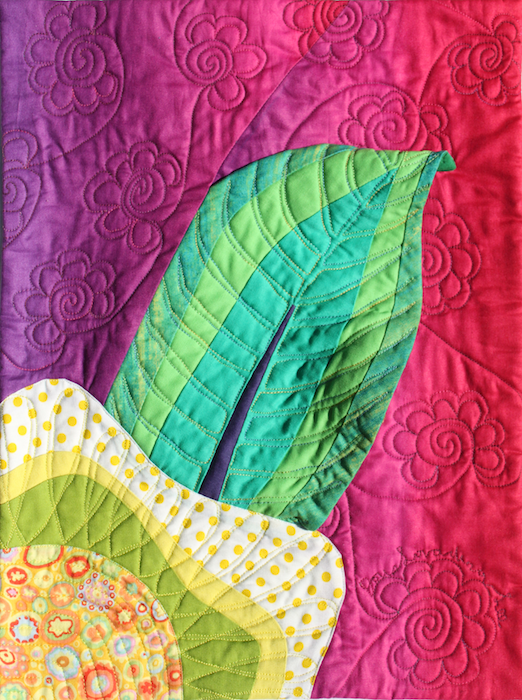 Chrysalis Awakening was the quilt I created as part of the Canadian Quilters’ Association “It’s Time for Colour Show“. This piece was sold and the money is going the Children’s Wish Foundation of Canada. Those of you attending the Creativ Festival on April 24-25th will have the opportunity to see these beautiful one-of-a-kind quilts in person. As soon as I finished this piece, I knew that I needed to create three more to complete the cycle. There are four stages in the life cycle of a butterfly: egg, larvae, chrysalis and adult. With Chrysalis Awakening, I had completed the pupa or chrysalis stage, where the larvae or caterpillar anchors itself to the underside of a leaf and transforms itself. 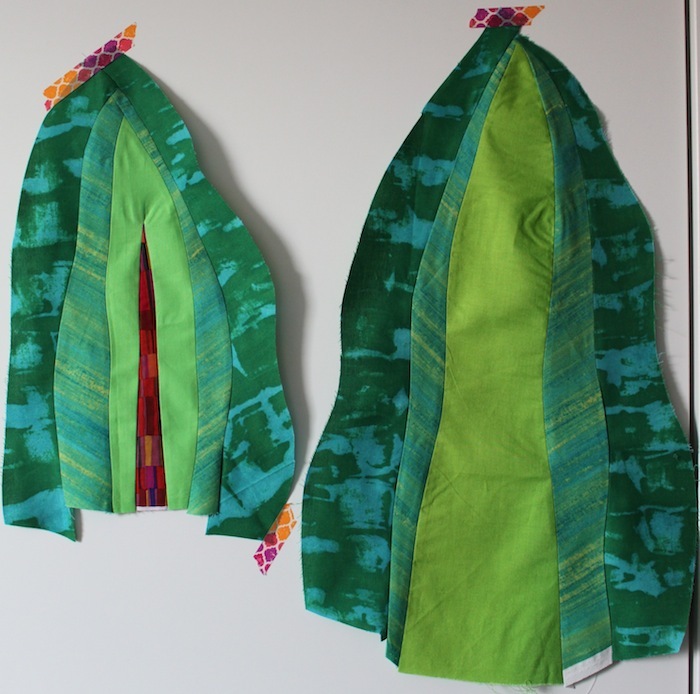 To create the other three stages, I pulled some green fabrics to create the leaves. 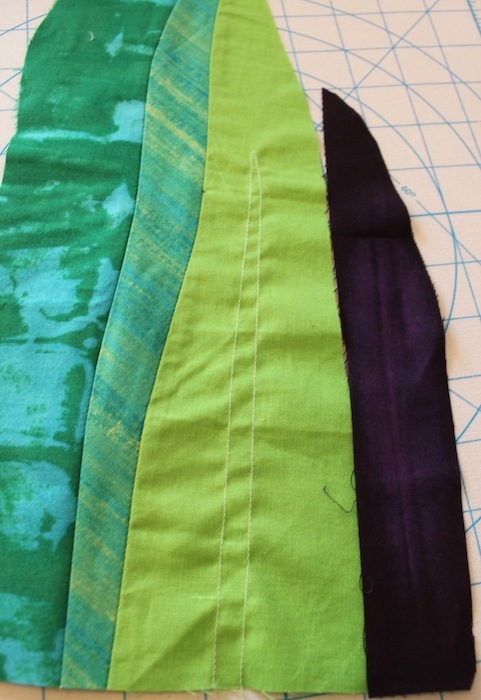 These are improvisationally pieced and so much fun to make. The one on the right above is too big! So, taking the leaf that was too wide and long, I cut a curved section out and will piece it back with smaller sections on each side. Below, I’ve stay stitched the area where I am going to insert the purple fabric to create the vein. I’ve included just a few of the process pictures. 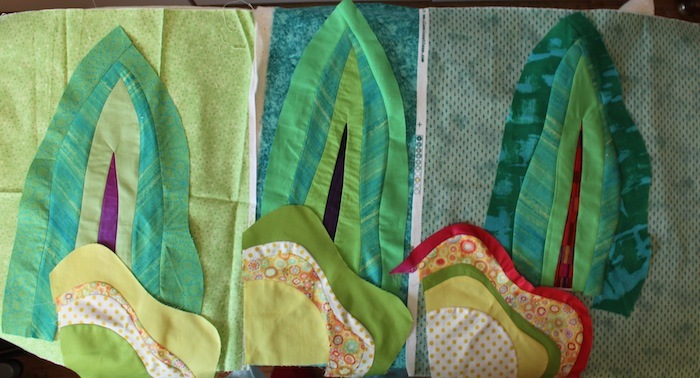 I still need to individually back and free motion each leaf, insert the leaf into the background fabric, free motion quilt it, appliqué the flower and then quilt it, and bind each one of the quilts. Each leaf will also have a special surprise hiding underneath. The quilts will be similar but not identical, each having their own personality. Above, you can see that I’ve grouped the leaves with the backing fabric and flowers. I may switch them around again before they are finally pieced into the gorgeous cotton ombre fabric of the background. 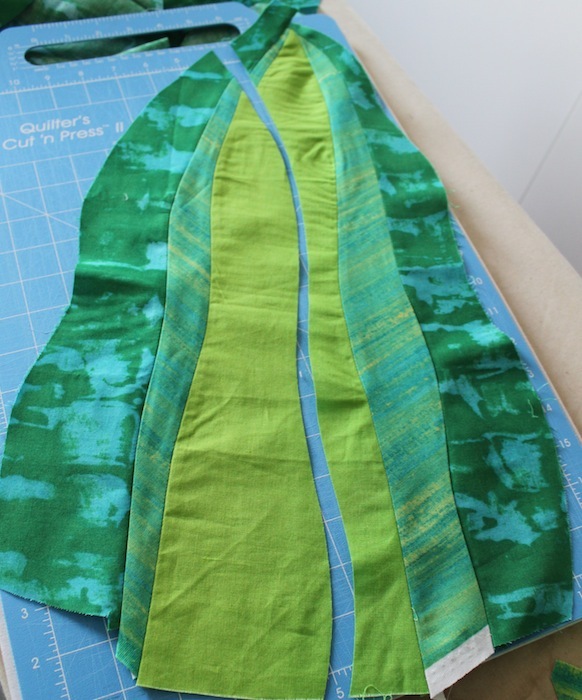 I will use the same piece of fabric I used in Chrysalis Awakening but each quilt will be a different colour, due to the gradation across the fabric.